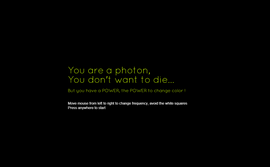 You are a photon, You don't want to die... But you have a POWER, the POWER to change color ! Move mouse from left to right to change frequency, avoid the white squares.